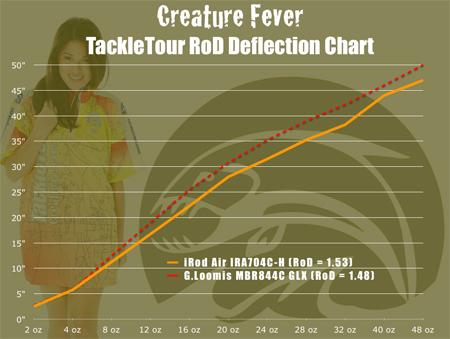 Balancing Around AIR : iRod Fishing's IRA704C-H.
Introduction: Our introduction to iRods came several years ago while on the water in the California Delta with Bub Tosh of Paycheck Baits helping him with some prototype testing and filming for his company. 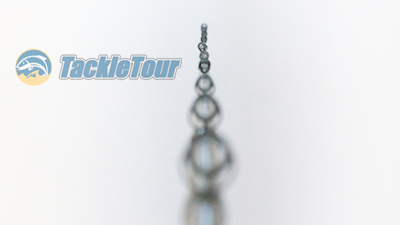 Bub showed us these new rods he was working on with Matt Newman and shared with us, in confidence, the name of the company and some details on how it all came about. It's very difficult to draw any conclusions from prototyped products, so we sat in the wings waiting for the final products to materialize. They eventually did, but just as we were getting ready to pull the trigger and pull some product in for testing, we got wind that a second generation of iRods' original series was in the works, so we waited again. Then, as with a lot of products that make it on our "to review list", iRods got buried under a heavy matt of other products. 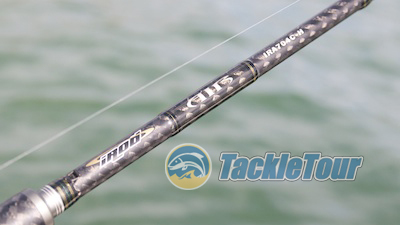 Introducing the iRod AIR IAR704C-H.
A call from Matt Newman himself helped to clear this quagmire of product but the interesting news that rose up out of that conversation was the knowledge that iRods had more than just their Genesis series of rods. Yes, to accompany their entry level sticks, iRods also had another, higher end series, iRod AIR. Certainly nothing fuels my investigative enthusiasm more than a new top-end product from any manufacturer. Presenting our review of iRods' Air series IRA704C-H.
Quality/Construction: The AIR IRA704C-H is a seven foot stick rated heavy in power. 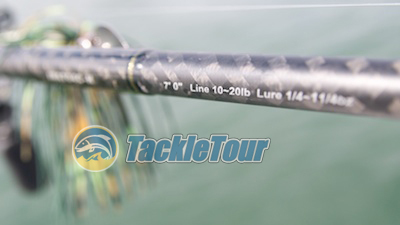 Although details are a little unclear, apparently all AIR series rods are built on a blank featuring the same or similar cross weave technology as Evergreen, Megabass, Shimano Japan, Daiwa (Steez Rods), and more. The IRA704C-H features a split rear grip made of EVA foam, and a customized hood on the Fuji ACS reel seat locking mechanism. Most everything checked out fine with our IAR704C-H save for that one guide you can see leaning slightly to the left. The blank itself has a very light, satin finish to it and epoxy application is made very cleanly. Looking down the length of the rod from the reel seat towards the tip, our review specimen was straight, but there was one guide out of alignment. 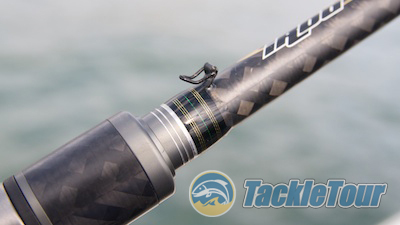 Each rod in the AIR series features a carbon weave around the blank similar to many JDM companies. Performance: Out on the water, I fished the IRA704C-H with a variety of reels including Daiwa's Lexa, Abu Garcia's Revo MGXtreme, and Shimano Japan's Calcutta 12. These reels were spooled with either braid or fluorocarbon. But we're unclear as to whether the extent of the weave is just what we can see through the first third of the blank or if it runs the entire length of the beneath the standard graphite pattern. Casting: The IRA704C-H is a heavy powered rod with a lure rating of one quarter to one and a quarter ounce (1/4 - 1 1/4 oz.). The upper end of this rating is met with little difficulty, but realistically this stick loads and casts/pitches best with baits down to about three eighths of an ounce. The IAR704C-H features a Fuji ACS reel seat. 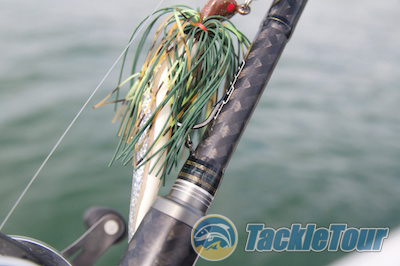 Matched with the proper reel, you can present baits down to one quarter of an ounce but that's more due to the ability of the reel than it is the rod. The tip doesn't even begin to load until you put about three eighths of an ounce worth of weight on it. This isn't necessarily a bad thing as the IRA704C-H is hardly a finesse stick and we wouldn't even have bothered to try it at this weight if its ratings didn't suggest as much. 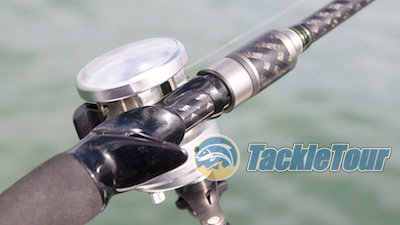 This hook keeper is functional if not a bit clunky. We'd like to move it so the detailing beneath the reel seat locking mechanism can be revealed. Sensitivity: We're told the IRA704C-H is made of 40 ton graphite material. This is the raw material from which most higher end blanks are constructed. The rod's blank does not have that the same metallic sound and feel to it as some other very high end blanks, but its sensitivity is good nonetheless. I fished this stick with either braid or fluorocarbon and did not test it with nylon monofilament, but for the great majority of techniques for which you're going to want use this stick, a superline or fluorocarbon (or combination thereof) as your main line is the right choice anyway. When actually in use, the Fuji hook keeper works. Power: As with most sticks that come with the label of "Heavy" power, the IRA704C-H has a really good backbone. 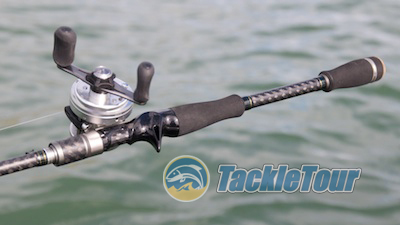 The transition from flexible tip to its power center is very smooth and once you hook your catch, this stick gives you good leverage to control the fish. Fig 1 : The deflection chart above illustrates how the IRA704C-H (orange curve) behaves under load in comparison to the MBR844C GLX - our baseline "heavy" powered rod. As you can see, the IRA704C-H has a bit more backbone than the MBR844C GLX.